Recognize and celebrate the excellence in work that is done in the weekly newspapers across Alberta. 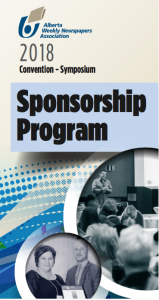 Your sponsorship will give you the opportunity to meet the decision makers of the industry and help you get your message across. It will help the AWNA continue to encourage, recognize and reward the hard work and achievements of the community newspaper staff. Over the years, AWNA has co-operated with other Alberta industry partners or initiated by itself, a number of successful awards, recognition programs and scholarships. The fact that these activities have consistently proved useful to individuals and our membership, is testimony to their value. 1-800-282-6903 • 780-434-8746 • for more details on what is available. verbal recognition at the event as well as signage. your company’s logo and/or name will be included on AWNA’s webpage and Facebook page. Part of the Better Newspaper Competition includes the photographic awards recognizing photographic excellence among Alberta’s weekly newspapers. With the Gold package, your company will receive exclusivity to the photographic awards. These are suggestions only. We will be happy to customize a package to fit your budget.